Who is a non-beginner? Someone who is comfortable with his instrument. Ukulele players , often self-taught or have taken a few beginner workshops, are non-beginners if they already know how to tune, play the basic chords from memory (C, F, G7, Am, C7) and strum instinctively. They know how to read a chord diagram. They know how to look at a song sheet and finger the chords indicated with the lyrics. What would a “ukulele for the non-beginner / busy adult” course include? Adult beginners not only have different levels of proficiency but also different rates of learning. In a group piano situation, the challenge of teaching multiple genres of music is analysed in this blog post. 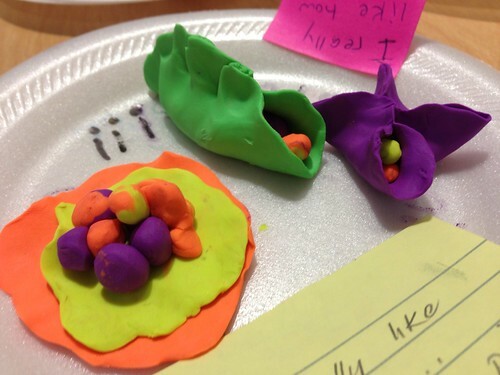 In this blog post, I think out loud, just like the colorful clay objects of food that I created in my week-long writing workshop on Maui. In their student evaluations last semester, my piano students indicated they’d like to learn more than just classical music. My students consider everything from renaissance to modern contemporary as classical music. What they want is the non-classical variety, i.e. rock, pop, new age, jazz, blues, etc. Little do they realize that within classical music itself are different genres, and by far the broadest group to offer the biggest variety of genres! Other than what is already given in the textbooks, how do I best introduce different genres to beginning piano students? First start by perusing the extensive music genres list. How about presenting this as a lecture, or better, a homework assignment where they have to choose 3 genres to listen to and discuss in class? The result is a menu that students can select and study for the semester. Adult beginners prefer playing music that is easy but sounds difficult and not childish or silly. Here is where I can explore rock, pop, country, jazz, blues, world music, new age music, etc and find simplifications for piano. If I can’t find these, I’d have to arrange them myself. Here is a good starting point though. I should add that adult beginners learn fast but get frustrated when they have to spend too long at a piece. It’s much easier to have short pieces that challenge them in one specific way than longer pieces that challenge them in 10 different ways, forcing them to study for a long time. Students learn at different pace. Some start slowly but speed up later. Others improve very quickly. In a group piano class, I have limited time for individual instruction, which is the preferred way to address different rates of learning. Instead, I need to weave what I want students to learn in group situations, such as partnering with another student of a different level. The more advanced student can help the less advanced. Is there a book for adult beginners that covers different genres? Why reinvent the wheel if it already exists? I would need to do some research to find which genres are most appropriate. And then find piano solo works of the right levels of difficulty, or shall we say, challenge? !